Create a profile, find business consultants, rate & review work done! As we all know, many businesses make use of Professional Services and the specific needs of clients vary a lot. In addition, the global Professional Services industry is huge and their services provided cover all aspects of general business operations. From determining the best legal structure and establishing your corporate brand towards complex issues that come into play when going international or deciding on a strategy to beat your competitors. On the other hand, the core business processes of a small company do not differ that much from a fortune 500 company, in essence. Both businesses administrate their day-to-day activities, draft legal contracts, market their products, establish a website, have their logo and corporate identity designed, determine a long term strategy and pay their taxes. However, due to the limited resources of a small business and the simpler nature of their organization structure the advisory needs of smaller companies do differ a lot from the needs of a big enterprise that has organized all its activities in highly specialized and separate business processes. In general, smaller business try to do as much as possible themselves. And when they need the help from an outside advisor it better be advice which is pragmatic and which can directly be implemented into the daily operations without to much hassle. Big companies, on the other hand, are often organized as a functional matrix organization, whereby each department has its own specialization and is also managed by function specialists, like heads of Marketing, Finance, HR etc. As such, these departments have a lot of specific knowledge and when they need the help from an outside advisor such advisor generally has deep industry knowledge, knows a lot about a very specify subject but at the same time should have a clear helicopter view. As said , all companies, from small to big, go through the same business processes and as such are searching for the same type of business advisors. Typical services needed touch upon the following core business flows: Accounting, Consulting, Legal, Tax, Marketing, Web Design, Recruiting, Writing & Translation and Design. 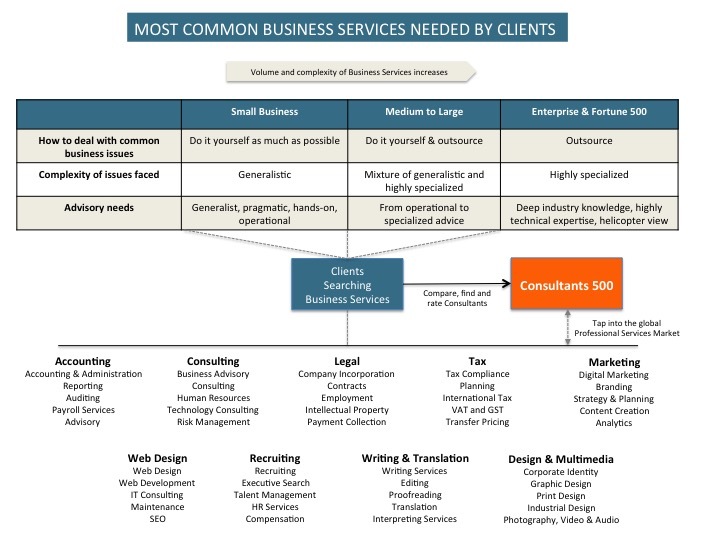 The firms offering these services also come in many flavors, like: full service versus specialist firms, major international players versus niche specialists with only 1 or a few offices, small business focus versus fortune 500 clients and typical start-up issues versus highly complex issues when getting your company ready for a stock market launch via an IPO. A recent survey shows that businesses looking for advisors typically use the following channels to find the best person for the job: Web Search (75%), Service Provider Websites (73%), Events/Seminars (54%), Peer Recommendations (54%), Online Associations (42%), Media Publications (38%) and Social Media and Blogs (35%). From the above it can be concluded that the internet is by far the leading channel for finding your ideal advisor. However, the internet is literally loaded with millions of advisors who say they can deliver exactly what you need. The problem is how to find and be found in a quick and easy way. Ideally, you create a shortlist of advisors that meet your demands, compare them, select the best one for the job and that only within a few minutes. 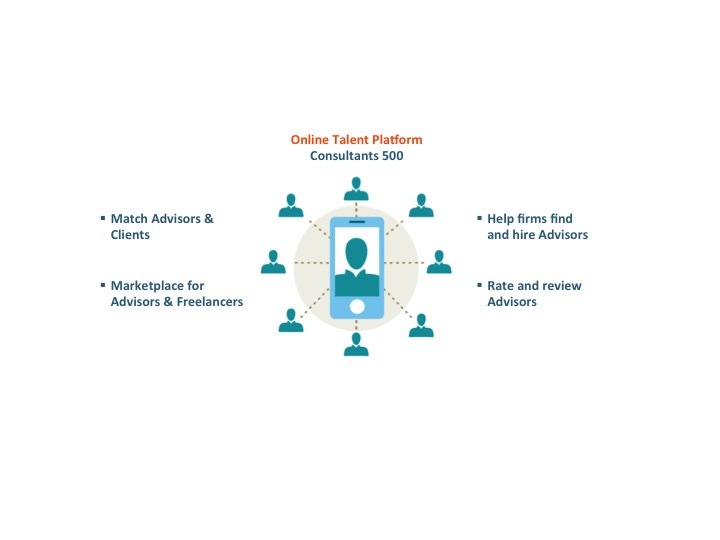 Our online platform, Consultants 500, is just the tool for that! We make the advisory world more transparent by sharing advisor’s specialization, their work and their clients’ feedback. Create profiles, find business consultants, rate & review work done! Email us at info@consultants500.com for any questions, suggestions, ideas or when you would like to post to our Blog.